Ultraviolet Titan - Universe Galaxies And Stars Section. 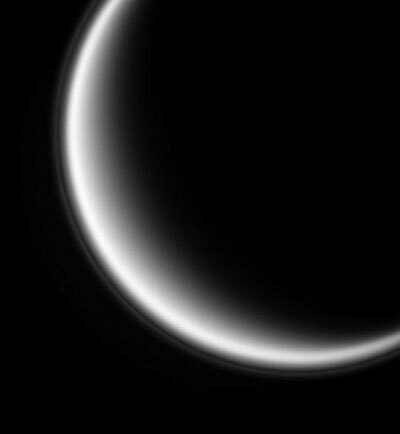 Thin haze around Titan. Image credit: NASA/JPL/SSI. Cassini snapped this picture of Titan on September 24, 2005, before its recent flyby. If you look carefully, you can see a thin haze hanging just above the surface of Titan's surface. This is part of Titan's atmosphere, visible at an altitude of 500 km (310 miles) above the surface of the moon. The particles in this part of the atmosphere are the exact size that scatters the ultraviolet light that reaches Cassini's cameras, which is why we can see it. Looking back toward the Sun brings out the thin haze that hovers 500 kilometers (310 miles) above Saturn's Moon Titan. The haze is composed of small particles whose diameter is comparable to the wavelength of light, which is ultraviolet light centered at 338 nanometers. Particles of this scale scatter sunlight most effectively in the direction opposite to the direction of sunlight. scientists are still trying to understand what processes produce this thin, high-altitude haze layer. North on Titan is up and tilted 10 degrees to the right. Titan is 5,150 kilometers (3,200 miles) across. This image was taken with the Cassini spacecraft narrow-angle camera on Sept. 24, 2005, at a distance of approximately 917,000 kilometers (570,000 miles) from Titan and at a Sun-Titan-spacecraft, or phase, angle of 145 degrees. Image scale is 5 kilometers (3 miles) per pixel.